Faceted, AAAA, aqua blue labradorite and sterling silver pendant necklace. A beautifully faceted, AAAA, super flashy, labradorite teardrop glows with bright iridescent aqua blue and turquoise hues from many different angles as it catches the light. Wrapped with sterling silver wire above the teardrop is a faceted, AAAA, sparkling, labradorite rondelle with matching aqua flash. The labradorite gems are attached to an elegant heavyweight sterling silver bail. One side of the pendant is shown in the first seven photographs, and the other side is shown in the last picture. Like all the labradorite jewelry in my Etsy shop, these are natural and untreated gemstones. 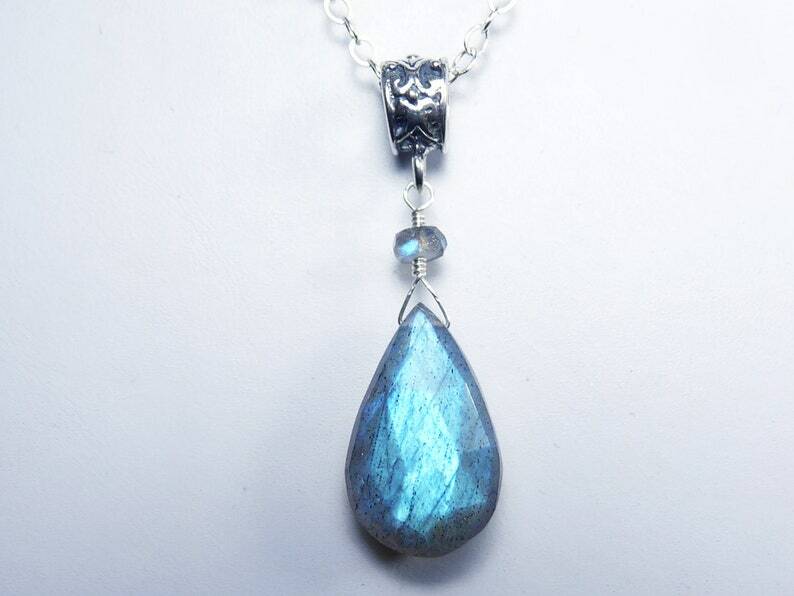 The labradorite teardrop measures 20mm x 13mm x8mm (13/16" x 1/2" x 5/16"), and the rondelle is 4.5mm. The pendant dangles 40mm (1 5/8") from a sterling silver chain that fastens securely with a sterling silver lobster claw clasp. The necklace is shown with a 17" chain in the photographs. The pendant is removable, so you can also use this versatile chain with other pendants. This eye-catching labradorite pendant necklace flashes and glows with bright and beautiful color!